I was again in Old Delhi, standing in front of Jain Lal temple and tracing a mental path of the walk for the day. The more I walk around Shahjahanabad, the more I want to know. The more I want to explore, the more I know of that I do not know. I yearn to talk to the people on the road, on the side lanes, in shops, in prayer halls of various religions, in hotels and those who are walking on the same road. My garb makes me look like a tourist. And even when I speak in Hindi, people reply back in English. When I point this out to them, they stop and think for a moment but then again continue in English, however, broken it may be. This is beside the fact that I have no trace of being a non-Indian in my looks. With these thoughts in mind, I cross the road and come to a small lane, which has two main attractions, and God only knows how they came to co-exist in this narrow lane. First one is the electronics market. Where you can go and buy anything, mostly fake items, and all possible pirated videos and even get your electronic items repaired. The second is the flower market, where you would see piles of fresh flowers. Still contains all the fragrance being woven together in garland by various hands. If you focus your eyes on the needle that goes through the flowers one by one, all you would see is some dusky hands. An almost invisible needle and thread, and mountains of flowers being sewn together. Some petals fall away, and others just mourn the parting away of a part of them. In some time, they will be a part of a dead stone who people think to be a representation of God. And by tomorrow the fragrance would be gone. What would remain would a skeleton of what it is today. Whatever be the journey, they would cease to be a flower in a day or two and become a part of garbage. Move on and the electronics give way to the electrical goods market, with a few hidden eateries here and there. Stop by for the famous Japani Samosa, which is something that you get only on this corner. This time the Samosa guy also offered me to try his Sarson ka Saag. Which he said is his new recipe along with Tandoori Makki ki Roti. I tasted it, but I could not have it to my heart’s content then, but I am going back for it someday. Along the way, you see the smallest retail formats. Where a small pushcart serves as everything from a storehouse to a kitchen to a cooking and serving platform. Customers just cluster around and enjoy the fresh food. On the road is an Arya Samaj Diwan Hall, and the road is named after this place. This is a big auditorium with a Dharamshala on top. Not a very well maintained building. But I feel that it must have been an important place during the independence movement. There is supposed to a small temple in the building. But we could not find any and nor could we find anyone to explain the place to us. There is also an old Moti Cinema hall, which is still operating and is usually playing the latest hit. It has been ages that I watched a movie in a single screen old style cinema, so another to do on my list. Walk along and get into Baghirath palace. Today it is a mish mesh of narrow lanes some of which lead to dead ends and some to other areas of old Delhi. This place is famous for decorative electrical items like lamp shades. You see a row of shops selling various electrical goods and items. Some of them would make you feel nostalgic about the past like gramophones and old tape recorders. Somewhere in this chaos of Shahjahanabad, you would find a huge colonial style building which now serves as premises for a bank and has Lloyds Bank Limited written on its top. It is a heritage building, which once belonged to Begum Samru in the early 19th century. The last Mughal, Bahadur Shah is said to have stayed in this building after he was captured for being involved in the mutiny of 1857. This was bought by Seth Bhagirath Mal in the mid 20th century and hence the area got the name. The pillars in the front give a Greek appearance. The major portion of the palace is now used by the bank. And the rest has been distorted beyond recognition to accommodate shops all over and all around. Like I always say, you have to go to Old Delhi with a lot of imagination for you to be able to see how grand the things would have been. And how luxurious the lifestyle of the inhabitants of these palatial buildings may have been. Surprisingly, it is not very easy to locate this building. When you ask around, no one really knew it by Begum Samru’s name. Walk out of the palace and your imagination and the road would lead you to Mor Sarai. On both sides of the road, you would see several small temples. Some of which have been institutionalized by giving a coherent look with the shops in the background and some of them are just beside the tree. All of them have a glazed tile layer now, making it easy to be maintained for the caretaker. And a grill which can be closed at night, often painted red to indicate the allegiance. The idols wear saffron clothes and you would see passers-by stop and pray for a few moments and then move on. As the Mor Sarai joins the road leading to old Delhi railway station on its right, on your left you would see a huge building, looking like an old army barrack with Delhi Public library written on it. This road was originally called Queen’s road. And has a garden which as called the Company Bagh, and is now called Bench and Bar club. Names indicate that the road must have been an important one. As it had the railway station, the most used mode of transportation joining the red fort through this road. Today too it remains an important and busy road. The company Bagh is now used by people to do whatever they like. The board is used to dry clothes for the people who live in or around the Bagh. The Delhi public library was my chance discovery of this walk. The front door was closed but the casual inquiries lead us to the back door. We were lucky enough to meet the librarian who took us around and gave us the guided tour of the place. You may not know that this is the biggest public library system in Asia. They have books in English, Hindi, Punjabi, and Urdu, along with a library of audios and videos in various formats and more than 15,000 books in Braille. They also have a collection of paintings, children’s books, newspapers, periodicals, and reference books. In this age and time too, the lifetime cost to access this library is mere Rs 2/-. You have to be a resident of Delhi and you can either visit the library or get the books through courier. The old catalogs have been digitized and made available online. This library was established just before independence and was inaugurated by Pt Nehru just after independence. There is a big auditorium in the library premises, which was full of books that the library intends to donate or give away as most of them are in a dilapidated state. I have not, and I believe most people would not have seen so many books together, piled on top of each other. As our eyes were lost in this amazing sight of books all around, I saw a wooden plank at the end of the auditorium. I was told that there is a room below this auditorium of the same size. That is also completely filled with books. Can a bibliophile ask for anything more? Library staff was very co-operative. And without asking any reasons they showed us around and told us about the library, not a usual case with most government-run organizations. What was more intriguing about that wooden plank was not just a parallel room below the auditorium. But a Surang or a secret passage that goes from here all the way to Red Fort. The passage has apparently been closed so that it is not misused. But this leaves a question about the age of the building. Was it really a British Barrack? Was the secret passage constructed by the British? Or was there an old Mughal building which was probably a part of the red fort. And was later converted by the British as a barrack. The area was in the limits of Red fort as further down the road at Bankhandi temple, there is a Burj or a dome that is said to be one of the points from where the red fort was guarded. Some way down the road is Bankhandi temple. Which literally means a temple in the jungle. Before I reached the temple, I expected it to an ancient temple. From the times when this area was a jungle, just like some of the mosques and Hazrat Turkman’s dargah, this may belong to the sadhus who preferred to live in seclusion. But I was wrong, and the temple is less than 100 years old. It gets the name from the Sadhus who are Bankkhandi or who have spent some time in either jungle or in the Himalayas. 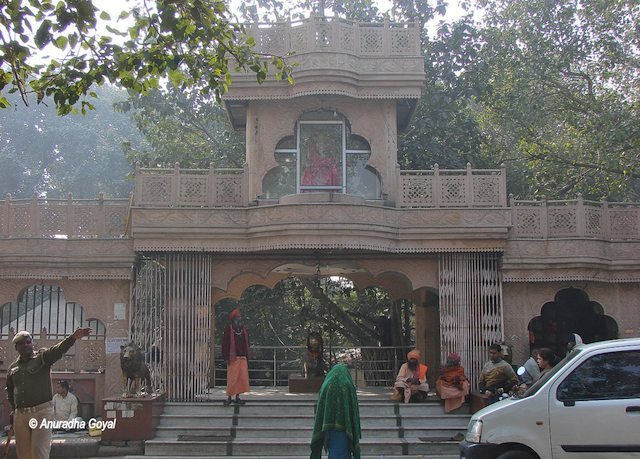 There were quite a few sadhus sitting at the entrance of the temple. The ornate entrance actually takes you to a cluster of small temples covering all major Hindu deities. When we expressed a wish to know more about the temple, we were taken to the head priest, who is also a Sashu who has lived in the Himalayas for some time before coming to this temple. He was young and agile and lived in a cave look alike basement of the temple. We chatted with him for some time and whatever he said was often acknowledged with adjectives by his disciples and other sadhus. Interestingly, he was also as curious about us as we were about him. He offered us tea and it was a nice conversation over tea. He also pointed us to the red fort dome in the temple premises. There were some intriguing bells on the wall of this temple, where the passing by the public can stop, ring the bells, say a small prayer without getting into a temple and move on. From here we moved towards the town hall, going past the Mahatma Gandhi Park, which is a fairly large park given the congestion around it. The statue is royally used by the birds to rest and relieve themselves. On the footpath outside the park is a long line of load bearers who are in a queue waiting for their turn to be engaged. A little further, there is a pink colored mosque which is under renovation. On the left is Townhall, where I assume a number of government departments operate from. 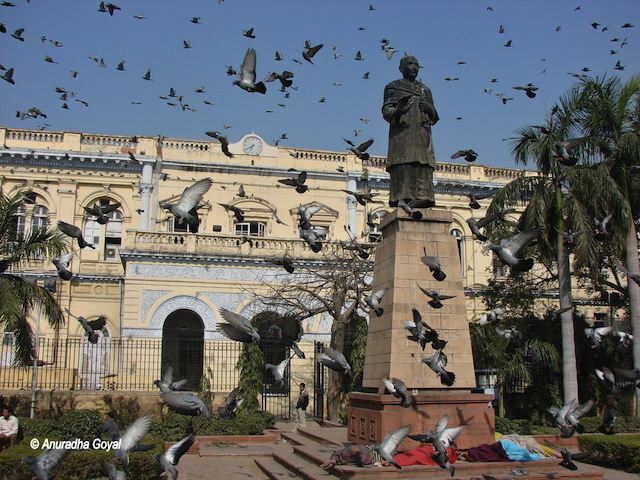 A statue of Swami Shraddhanand adorns the front of the town hall and this is where you would see a whole lot of pigeons. You can feed them or simply stand there and watch them enjoy their food and take collective fights. It is time now to stop by and enjoy some old Delhi food. The more I walk around Old Delhi, the more I come to know of things that I need to see… Hope to continue this journey while the weather is benevolent and I am here in this city. 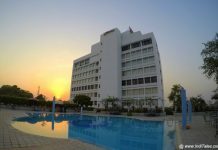 Recommend you to read the following travel blog on Places to visit in Delhi. That secret passage is very interesting and intriguing.